Some of the consultants bidding to advise GOM on the Port Little Bay project. 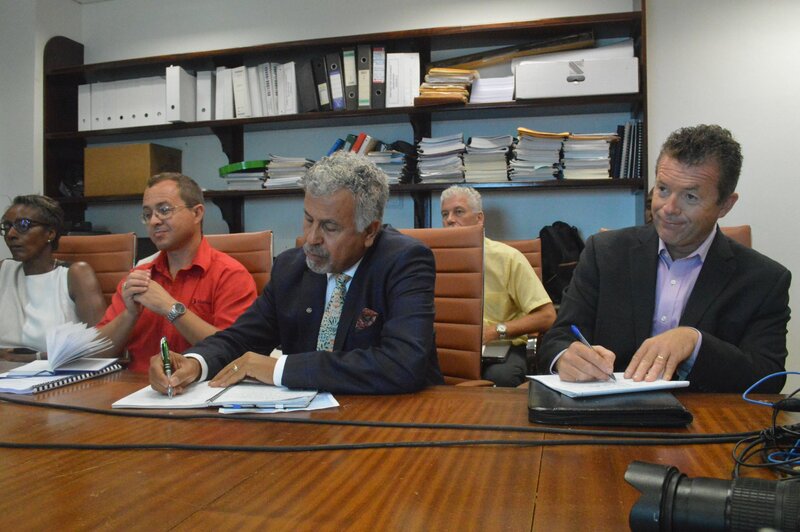 Four of the five firms bidding to manage the environment and social impact assessments and the technical consulting for the Port Little Bay project are currently on island to meet with the Ministry of Communications and Works. On Tuesday, Hon. Minister Paul Lewis provided an update on the status of the project, now that funding has been secured and early indications are that they will be able to deliver to Montserrat a port to the value of 21 million pounds/ 88 million XCD. The port project is being funded through the Caribbean Development Bank (CDB), using allocations of 14.4 million from the United Kingdom Caribbean Infrastructure Partnership Fund (UKCIF) and an additional 7,098,000 million pounds from the European Development Fund EDF11. Press Conference to announce start of public stakeholder consultation for Port Little Bay with Rolando Kassie and Hon. Min of Communications and Works Paul Lewis. Project Coordinator for the ministry Rolando Kassie, said 24 companies responded to the tender for technical consultancy, of which six were selected. One of the companies has now withdrawn from the project. The remaining five are IMC Worldwide, Stantech Consultant Int’l, BEHI Consultants, Mott McDonald and Caribbean Coastal Services. No representative from Mott McDonald is attending the current meetings. While on island, the consultants will be taken on site visits and provided with information on the government’s tendering process. It is hoped that an agreement will be signed by October for this phase of the project. Kassie said these meetings also signal the start of the public consultation process. He explained that stakeholders, including fisherfolk and boaters, will be invited to make their contributions on various aspects of the plans. 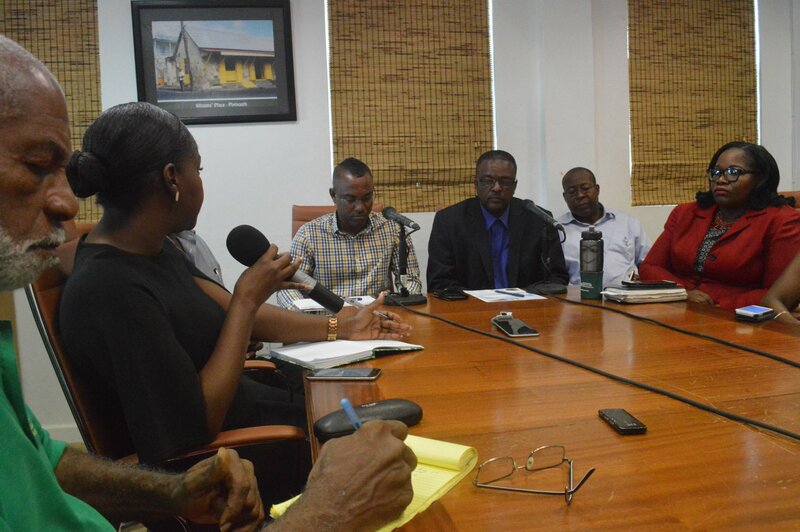 The coordinator told the press this is still an early stage and the consultant selected will assist the government in completing the plans which take into consideration climate resilience, the multi-purpose use of Little Bay and other environmental concerns such as the bat cave. He revealed that they had been cautious in approaching the public until they had developed a concept for the port expansion and estimates on the construction costs. Phase one of Port Little Bay project is to include a breakwater and a roll on roll off facility for cargo docking. The port will also accommodate small cruise vessels. Ministry officials gave 2020 as the completion target for the pier.